Editor’s Note: Given that this magazine was the first to publish pages from Zhang’s book, and that, since that time, the author has herself joined our masthead as fiction and nonfiction editor, this magazine certainly can make no pretense to absolute objectivity in her regard. We know what we like, and we think it’s our job to convince you to share our tastes. That said, we’re also happy that David DeGusta shares our enthusiasm. Reading studies of human memory is a profoundly unsettling experience. We are all, it turns out, unreliable narrators. Our eyes are not cameras—filtering and interpretation happen simultaneously with viewing. Our minds are not hard drives—memories can be reshaped by the mere act of recalling them. So how are we to understand our own past, let alone that of another? 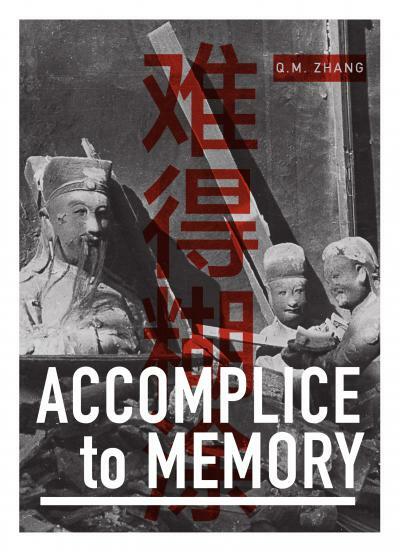 This is one of the foundational questions explored in Q. M. Zhang’s trailblazing debut, Accomplice to Memory (Kaya Press, 2017), an account of a daughter’s attempt to unravel and (re)construct her father’s past, especially his escape from China in the wake of the Communist Revolution. Zhang’s approach to the problem of memory—in this case, her father’s memory—is to employ a mix of memoir, fiction, history, research, and photography. The combination succeeds most wonderfully in communicating the understanding Zhang develops of her father’s past. Accomplice to Memory also provides a sense of what it was like to live through several key moments in mid-twentieth-century Chinese history, to find a way to make it to America and build an American life there, and to be the daughter of a father talented at playing and discarding different roles. The book project starts as a memoir, with Zhang interviewing her octogenarian father about his exodus from China to the U.S., where he settled in the fall of 1951. He proves a reluctant and elusive informant, though the friction between interviewer and subject itself sheds light on, among other things, differences in outlook between first- and second-generation immigrants. A serious fall changes the equation, and the father opens up with revelations about his past, but in halting and sometimes contradictory fashion, with his failing health and uncertain memory frustrating the search for clarity and truth. Faced with a narrator of questionable reliability, Zhang turns to the form best suited to handle him: fiction. Interspersed with the present-day text, but set off in italics, Zhang invents the story of Wang Kun, a fictional representation of her father. This creative turn enables her to explore his possible pasts and bring them to life. The effect, rather than a sterile “re-enactment, is that of a novel set in 1940s China.” The characters are fully developed, their inner lives rich, the plot gripping. Moreover, the fiction here is no idle speculation; it is informed and constrained by a careful study of the historical record. Not content to rely only on existing sources, Zhang carried out fieldwork in Hong Kong and China. Zhang uses her background in anthropology and psychology to good effect here, much as David Carr used his journalism skills to investigate his own past in The Night of the Gun. Her scholarship is impressive—in addition to being a writer, she is a professor of cultural psychology—yet the text never feels didactic. Between my father’s need to forget, his inability to remember, and my desire to know. Between the spoken word and the unspeakable truth. Between sound and pictograph and alphabet. Between the hither and the farther shore. Up the sleeve of the smoking jacket. In the cracks in the sidewalk and the door in the ceiling and the chink on the fence and the tongue in the water. In the dirty little crevasses between crisis and opportunity. Photographs are integral to this book and form their own narrative, sometimes questioning the text, sometimes expanding on it. The images—a mix of family and historical photos—are uncaptioned, which seems a thoughtful choice here. Without captions, the reader is placed in a position similar to that of the author, and must grapple with the question of what they depict . . . . or flip to the back of the book to consult the photo credits. The final photos in the book—of the author’s father about to depart Hong Kong for “the beautiful country”—are especially moving. Tracking down historical photos, choosing which to use, and obtaining the necessary rights was certainly a major undertaking. Here again, Zhang’s skills as a researcher shine through. If there is an absence, it is Zhang’s mother. She occupies the margins, offering refreshments as Zhang interviews her father, but her reactions to the book’s revelations go unreported. To be sure, the book is explicitly framed as a father-daughter story, so this is an understandable lacuna. Accomplice to Memory is beautifully designed (by Chez Bryan Ong) and produced (by Kaya Press), with thoughtful use of white space and graphic elements that complement the narrative. The annotations and photo credits reflect Zhang’s rigorous scholarship and are a model for others to emulate. The use of thumbnail images in the listing of photo credits is especially helpful. The photos themselves would be wonderful to see in a larger size, or in a digitally “zoomable” format, though that was probably not feasible given the constraints of cost and copyright. The relatively small size at which most of the photos are printed (typically about 2” x 3”) does add to the book’s sense of straining to make out the past. The term “hybrid” is applied mostly to memoirs with more than the usual amount of invention, or to novels with less. Here, though, is a book that realizes the true potential of a hybrid approach as few others do, to be placed on your shelf next to Claudia Rankine’s Don’t Let Me Be Lonely and Kazim Ali’s Silver Road. Its combination of memoir, fiction, history, and photography captures how complex and partial any understanding of a loved one necessarily is. After reading Accomplice to Memory, it will be tempting to view as incomplete any memoir that doesn’t utilize such a multifaceted approach. How else, after all, can we triangulate between memory, fact, and truth? David DeGusta is a writer and translator, and a reader for the Massachusetts Review.